With that, I begin the arduous task facing any *ahem* fashionista who spends as much time and effort on her wardrobe as I do – switching my eclectic array of breezy summer fluffs for warmer winter fuzzies. Prepare yourself, Sammy. This is not a task for the faint of heart. Can you IMAGINE the physical exhaustion and mental exertion it takes me to pack, unpack, inventory and move that extensive fashion collection? When I hosted monthly bridge, after some fiercely contested hands, we snacked. I promptly, and predictably, dribbled food down the front of my sleeveless, scoop-neck, black-knit top. When I walked back into the room, Alice looked up at me and choked on her mouthful of iced coffee. I was wearing an exact (clean) replica of the top I’d just gone to change. “Five.” I replied, which made the other two women burst into laughter. Doesn’t everyone shop that way? 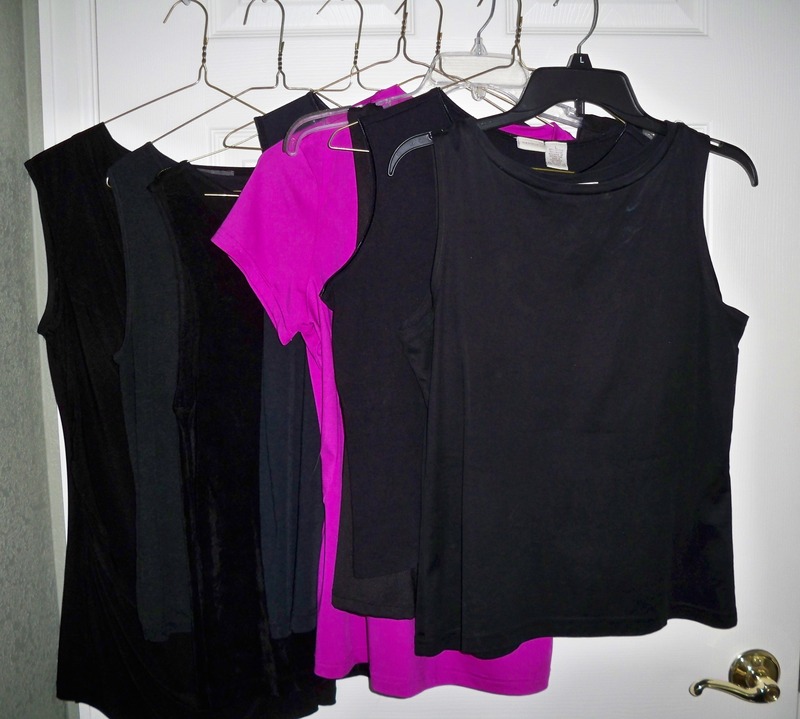 Find a top that fits – in black – and buy a bunch? There have been WAY too many times when I can’t find what I’m looking for, and I talk myself into a substitute that doesn’t fit; is a fabric I later discover itches or makes me sweat; or – worse – is a colored pattern. Hence my shopping dogma: When I find it in black and like the fabric and it fits, Buy Five. Occasionally – as you saw in my summer and winter wardrobes – I’ll go a little wild and throw in a pink or purple. But mostly, you’ll see me in black. Why black? Stay tuned for my next secret, which I’m sure I’ll regret posting. That’s how I shop for shoes. If I like them, I buy a couple of pairs. Me too. It’s not just black and pink … you have some white in your winter wardrobe! We’ve started buying Dr. Schools through Amazon. That’s one outfit that understands comfort and shoe sizes. Thanks for the recommendation. Will check it out! Completely cracking up. I used to be a fashionista. Walked all over in 3-inch or taller hells, had an array of amazing dresses and suites, not your typical. Then I stopped working in the corporate world and started painting. I wanted paint, not fashion. Yes, I do the same dang thing, when I find what fits I buy several, and at least half are in black or charcoal grey. I also tend to wear my clothes, and it has nothing to do with my age. I believe it is karma. I laughed and teased my husband for years about wearing his food and then I became the dripper of all things greasy. LOL I know – I was appalled when I first starting playing bridge because everyone is quite elderly (a dying game) and they ALL had stains on their shirts and blouses. Now I do, too!!! During my career, I loved dressing up – heels and all, and was lucky enough to be able to dress in boutique-y clothes rather than navy suits. That was a whole lot of fun till I had to have bunion surgery and the years at the desk made my whole body ache. Suddenly fashionable dressing wasn’t fun anymore. I’ve been thinking. I have a uniform now. 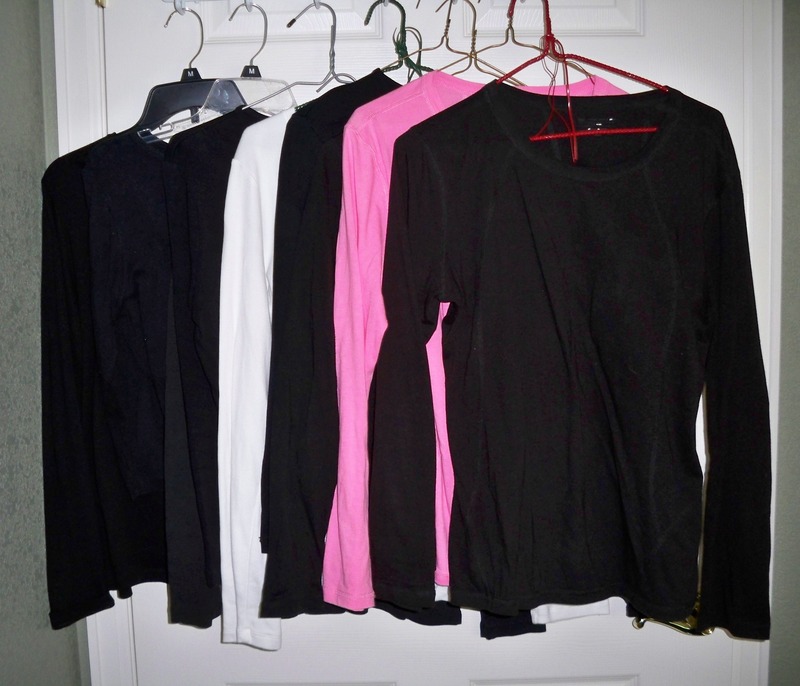 This year and last it consists of LLBean v-neck 3/4 sleeve t-shirts (3 in black) and pants from Pure Jill at jjill (grey/black/and a nice brown.) I have a few of their tees (3/4 length) in a few bright colors. THAT IS IT. Winter I over layer with Pure Jill kimono sweater and 10-year-old dkny sweater that I LOVE. More info than you wanted to know but I realized that I have a uniform. No, that is perfect and SO helpful. I got a couple sweaters last year from Eddue Bauer that I love, but I’m going to look for the pure Jill komono sweater because it sounds like one I’d like. Which guarantees it’s no lomger available!! is the next about bras? Write about bras, OK? LOL LOL IT IS !!! How did you know?!?!? My hesitation was Dan dropping me because of my (boring girly) subject matter. Is the third for the other hard-to-fit pair of body parts? The ones with toes? We covered shoes in Dan’s comment – “buy two” when they fit. I have 3 pairs of Keens and 2 pairs of Sauconys, and a very dusty pair of black Mary Janes for “dress up”. You mean to tell me there are other clothes than jeans and tee shirts? I buy several of the same jeans and the tee shirts are from Vintage Trailer Rallies. I do have two nice tops and a pair of jeans that I save for special occasions. Oh, and when I have too, I have a pair of slip on shoes. Total fashionista! LOL You rock!! I’ve read about those Vintage Trailer groupies and seen some of the websites. They are amazing!! I’ve never seen any on the road but I keep looking. Headed to Goodwill now to donate my never-worn pattern blouses !! 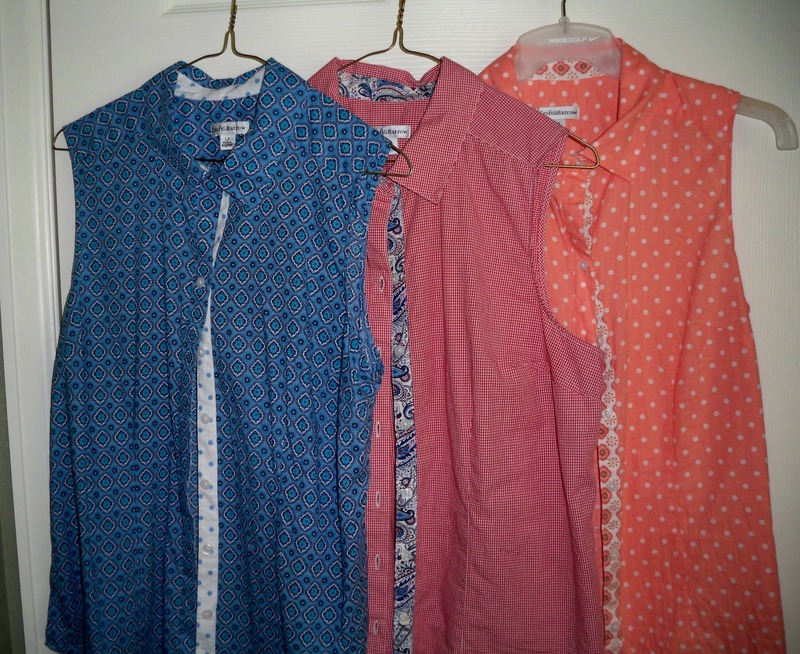 I have one patterned blouse. It has hung on the same hanger untouched for years. Maybe I should think about doing the same. Ok now you’re sounding eerily like me. I have a couple tops that I hate, hate, but I keep them because supposedly they are “travel outfits”. I have packed them every time we go to Europe, hate all the pics of me wearing them, then don’t touch them for 2-3 years between trips. I finally gave one away but there are still two lurking in the closet. Such silly creatures, we are! I’m not a fashionista though. I always say that I’m the quintessential multi-colored individual. BUT I hate shopping in a million different places and trying on a million different items! I hate shopping for clothes because it’s so hard for me to find anything that fits properly; the clothing industry seems to have decided that “Big and Tall” for men is actually “Big and Short.” So if I ever find long-sleeved shirts that are long enough, I buy several of them at once — especially if they’re available in grey or black or some very muted color. And I hate sales clerks who try to badger me into buying whatever I’ve selected in a different color: ‘Don’t get the grey one — you should get the blue one, it’s so much brighter.’ (I LIKE GREY. What difference does it make to them if I buy a shirt in grey instead of a bright color? They get the same money either way.) And shoes/boots… What a nightmare. Oh Man … (No pun intended) you just blew my upcoming rant on how easy shopping is for men compared to women :-). Seriously, I hear you! The proportions of tops and bottoms are all wrong for our bodies! I’ll have more to say in Part 3 in a couple of days. And I think you look your best in GREY! Haha, this made me chuckle. I loathe clothes shopping too and usually buy online – which has the added advantage of not having to undress in those awful cubicles with the ‘fat’ mirrors. I live in jeans, t-shirts (short or long sleeve depending on the weather) a couple of vest tops when it is really hot, and a couple of tunic tops for going out to dinner. I also have some black trousers (for going out too dinner if I feel jeans aren’t appropriate) and a couple of smart jackets that I rarely wear. Shoes are the same – I buy when current ones are worn out. Leather Birkenstock sandals in summer, trainer style in winter and a pair of comfy, flat ankle boots. Job done! (I must confess that I have also been tempted by patterns and even florals OMG for a change, but they are so NOT flattering. I like online shopping too, but it seems like no matter the brand, nothing stays available for more than a month or two and the sizes available always seem to be size zero or XXL. I think the heels and fashion were fun for awhile, but egads the heels these days? Women can’t even walk in ’em. My Birkies are my indoor shoes all day. And PS Sammy Quote: Florals are for Jude’s lovely photography, not for her clothes. I shall go through my wardrobe forthwith and head off to the charity shop. You are hilarious, Sammy! I didn’t realize so many people hate shopping for clothes. I confess to being somewhat of a fashionista, (although I’m not above wearing last year’s styles to save some money) and have to point out that those patterned blouses are soooo cute. I’m curious why you won’t wear patterns? My grandson said to me once, “You’re not really a girly girl are you, Mima.” LOL what gave it away? I am, however, intrigued by your fuzzy sweaters and matching scarves:-) i love the results of other people’s shopping forays. And I do love other kinds of shopping; just not clothes! I feel like a blogging success when I try a funny post and elicit laughter. Interesting about your nursing uniform because I know several women who spent careers in uniforms and now dress fashionably every day. I think part of my “comfort clothes” is all those years dressing up for work. Especially glad I put a smile on your face, Paula. Are you writing about ME??? Are you ME???? And I have my blacks available the entire year. Long sleeves, no sleeves. Never go without one with no sleeves! I could have been wearing blouses like that – but not with those patterns. 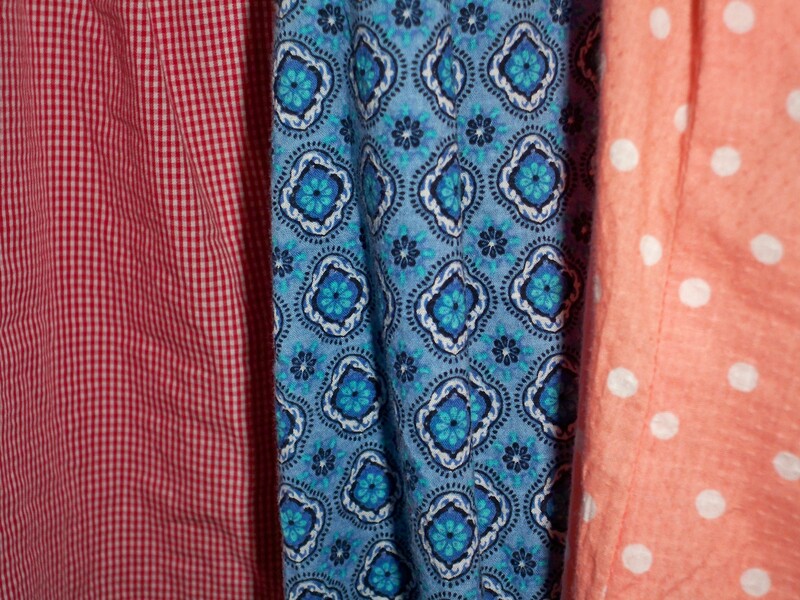 Never, almost never, patterns. And I wouldn’t wear them instead of my black for the day. Nope! IF – I’d wear one unbuttoned over the black. And off course I buy more than one! At least three! Hee, hee, great post! I hate clothes shopping for exactly the same reasons. Nothing I like ever fits right. The only difference is that when I do finally find something that fits, I buy the same thing in other colors instead of just black. I’m afraid I will always be fashionably-challenged. Sigh. The music in Walmart has driven me out screaming. No! I can’t hear you. The music is too LOUD!!! I’ve always loved wearing black – it goes with everything! Recently – that is, within the past couple of years – I’ve started introducing some colour and (*gasp*) patterns into my wardrobe. It’s fun, but it also makes it VERY difficult to pack as you just can’t mix and match as much as when everything is black! Exactly 🙂 Everything is easier with one or two colors. I do wear other bright solids, but black is my go to travelwear. I knew you tangled your tennies. It’s just a matter of time before we see tangled lingerie in your line of custom designs! During my formative years (high school) I wore a plaid pleated skirt and gray blazer with a white blouse. For 4 years. 4 fashion conscious years. I believe those years had a lasting impact on me and fully explain my total lack of fashion sense — and my total lack of caring about my total lack! During the dating years, my husband went shopping with me. This activity ceased once the ring was on my finger. He couldn’t understand why it was necessary to try everything on. “You know your size–so grab something that you like, and leave.” He didn’t get that garments with the same size labels could be too small, too big, or almost “just right” . Sorts like the three bears. That partially explains why I have a range of sizes in my closet. That, and some rather big meals, followed by weeks of exercise when my largest pants start feeling too tight! I have a friend whose formative years in a Catholic school uniform followed by a career in airline industry turned her into a true and daily fashionista. She’s the bright flower that blooms year-round! As for that “sizing” torture, you are spot-on, Shelley!! Hub can go in a store and pick shirt by neck/arm length size and pants by waist/leg length size, then checkout without ever entering one of those ghoulish dressing rooms!!! Raises my blood pressure every time I think what women have to contend with. Was going to post on “the sizing thing” till I got a comment from a male reader who lamented that he has to shop in “big and tall” where he really needs tall but the reality is it’s a “big and short” department! Thanks fir your input :-). All we really need is biking shorts and shoes and a helmut, huh ?!? Throw out everything that’s not black. Does that qualify me as a fashionista consultant? wooohooooo you signed yourself up there! Simplify, simplify, simplify. I think that’s a mantra for most of us over 50! LOL Good job, Sammy. 😀 I had my 1980s corporate wardrobe stored in the basement for years. Just couldn’t part with it, because the suits were all very expensive. Finally, I came to my senses and got rid of them all. Now it’s denim, denim and more denim (jeans, maxi skirts, shirts, jackets); also black and the occasional rose or fuchsia top. :-). Glad you found it funny! I love that your sister thinks you have “fashionista potential” !! I have the scarves, and they look really nice on the shelves in my closet 🙂 untied. OMG YES! Everything white, and if I like it and can afford it, extras in black, baby blue, or pink. Yes. I hate shopping. Hate it! Hate it :-). Just went to store this AM for BIGGER (wider) pants for winter and bought 3 black psir exactly matching. Winter shopping DONE! !